While the entire Bible stresses certainty and assurance for Christians who are born-again, there's one section of Scripture that stakes out this theme as its central focus—the letter of 1 John. As we carefully read through 1 John, we notice a five-fold argument for the assurance of salvation—five of the birthmarks of the Christian. These are characteristics and traits of someone who is born again through faith in Jesus Christ. The first is the birthmark of confession, described in 1 John 5:1: “Whoever believes that Jesus is the Christ is born of God.” Before you can have assurance of salvation, you have to believe and be saved. You have to confess Jesus Christ as Lord. Some people assume they are saved because they grew up in a Christian culture, or they have gone to church all their lives, or they have been baptized, or they have tried to live a good life. Yet they’ve never distinctly and personally confessed Jesus Christ as their Savior and Lord. The Bible teaches that we are sinners, separated from God by a sinful nature. We can never earn, buy, or climb our way into heaven. By our own efforts or goodness, we can never be saved. That’s why God became a man who lived a wholly righteous life, died on the cross, shed His blood for us, and rose from the dead. He paid our penalty, took our judgment upon Himself, and He offers us the opportunity to be born again. If the first birthmark is our confession of Christ as our Savior and Lord, the second is a changed life, as we see in 1 John 2:29: “Everyone who practices righteousness is born of Him.” When Jesus truly saves us, it makes a difference in how we think, act, speak, and conduct ourselves. The Bible says, “If anyone is in Christ, he is a new creation; old things have passed away; behold, all things have become new” (2 Corinthians 5:17). As we begin learning to practice righteousness, our habits change. We will not be sinlessly perfect while we’re on this planet; but if we’re Christians, we need to behave like Christians. If we say we’re saved but nothing has changed about us, something is wrong. We are not saved by good works, but we are saved for good works, and the Gospel is a transforming agent in our lives. Those who are truly saved also bear the birthmark of compassion. How can you know that you are a Christian? By what you believe, by how you live, and by whom you love. Love is a recurring theme in 1 John, and the apostle leaves no doubt about how it permeates the lives of true Christians. “Beloved,” he wrote, “let us love one another, for love is of God; and everyone who loves is born of God and knows God. . . . We know that we have passed from death to life, because we love the brethren” (1 John 4:7; 3:14). Do you love your brothers and sisters in the family of God? Those who are truly saved are those who enjoy and bless the household of faith, the family of God. A fourth sign of being truly saved is conflict. According to 1 John 5:4, “Whatever is born of God overcomes the world. And this is the victory that has overcome the world—our faith.” The word overcome implies a struggle. We’re faced with an adversary whom we must overcome. Our adversary is identified in 1 John 2:14 as the wicked one: “I have written to you, young men, because you are strong, and the word of God abides in you, and you have overcome the wicked one.” John went on in the next verses to say: “Do not love the world or the things in the world. . . . For all that is in the world—the lust of the flesh, the lust of the eyes, and the pride of life—is not of the Father but is of the world” (1 John 2:15-17). When you’re genuinely born of God, you’ll be growing to be an overcomer as you deal with the temptations around you—the world, the flesh, and the devil. You may not be victorious over every temptation every time, but you’ll make progress in gaining more victories and losing less battles as you grow stronger in Christ and in the power of the abiding Word of God. If we’re not careful, we might interpret this verse to teach that anyone who is born of God never sins. That would conflict with other passages in the Bible that describe us as fallible and often failing. If we are truly saved, we will grieve over our sins, confess them, and seek God’s grace to do better. You can have assurance of salvation today. His grace is inexhaustible and His salvation is irreversible. Make sure you have confessed Jesus as your Lord and Savior, and then trust Him with your eternal future. He will never leave you or forsake you. His Word was given that you might know Jesus Christ as your Savior and that you might know that you have eternal life. 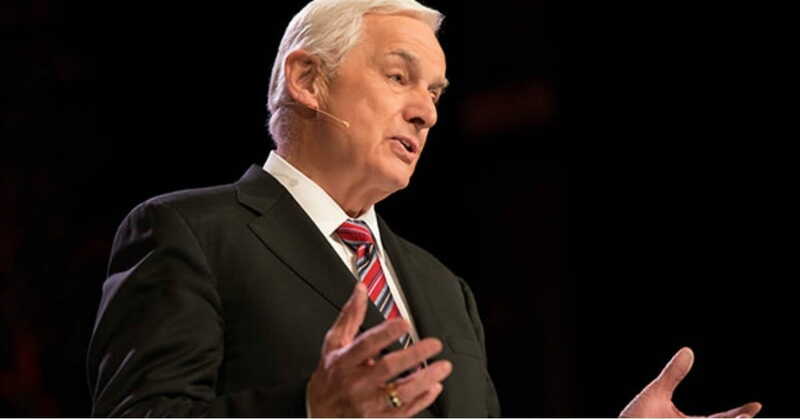 Article excerpted and edited with permission from Dr. David Jeremiah's book, Ten Questions Christians are Asking.